When you meet Rachel ask her… Where is the best gumbo in New Orleans? Who is her favorite jazz musician? What is her first memory of hearing her grandfather perform? 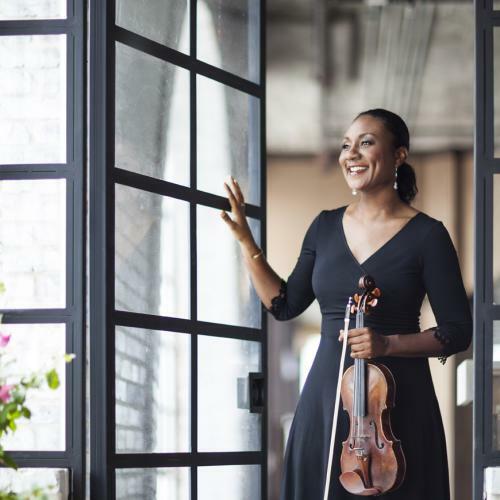 Rachel Jordan, a Professor of Violin at Jackson State University, a member of ROCO, and a member of the Carter Quartet at Loyola University in New Orleans, has served as adjunct faculty at Xavier University, Southern University, and Dillard University in New Orleans. Ms. Jordan was also a member of the Louisiana Philharmonic Orchestra in New Orleans for 12 years. Rachel has performed with her siblings for Jazz at Lincoln Center Higher Ground Hurricane Relief Benefit Concert, as well as numerous concerts throughout the United States. Ms. Jordan also performs on and is the executive producer of the Marlon Jordan Featuring Stephanie Jordan CD entitled “You Don’t Know What Love Is.” In addition, Ms. Jordan co-manages J Group Consulting, a family music management entity. Rachel has been a featured performer in numerous solo recitals, most notably at the Kennedy Center, the Mozart Festival in Salzburg, Austria, the Music Center of Houston, and the Mozart Festival in Washington, D.C. Most recently, Ms Jordan performed “The Lark Ascending” with the Jackson State University Orchestra for the Congressional Black Caucus Inaugural Ceremony of President Barack Obama. Ms. Jordan is also the founding director and artistic director of the Music Alive Ensemble, a classical and jazz ensemble of musicians, composers, and arrangers. Through its concerts, Music Alive Ensemble perpetuates cultural diversity and finds common ground through collaboration. Rachel is the fifth performer from a family of New Orleans-bred musicians. She is the daughter of saxophonist Edward “Kidd” Jordan. Siblings include flutist Kent, trumpeter Marlon, and vocalist Stephanie Jordan.